3 to 6 months – While babies drool for many reasons, teething is one of the most common causes at this age, since teeth commonly make their first appearance during these months. If your baby follows the typical pattern of teething (if there is such a thing), you’ll likely see the bottom, center teeth erupt first, followed by the two upper front teeth and then the two on either side of them. That said, for some babies it will be months before their first tooth erupts, and for others, they will show up in a completely different order. Some may come in all at once while others take their own sweet time and then poke through one at a time. While parents often assume their babies’ fevers are caused by teething, this is not a standardly accepted cause of fever by most health professionals – at least not for anything more than a low-grade fever. It may help to give your baby hard things to chew. You should discuss the use of medicines or other teething treatments and remedies with your baby’s doctor. 6 to 9 months – You’ll likely see the appearance of several teeth during this time period, if you haven’t seen some already. That said, some babies don’t have their first tooth erupt until after their first birthday. In addition to discussing the use of medicines or other teething treatments and remedies with your baby’s doctor, be sure you discuss recommended dental care as well or make an appointment with our Dental Therapist who is experienced in the care of children’s teeth. 12 to 18 months – Getting your 12 to 18-month-old accustomed to brushing their teeth (and having you brush them as well) will help teach them good habits for the future. Make an appointment for your child to see our Dental Therapist who is experienced in the care of children’s teeth. 18 to 24 months – Since most 2-year-olds want to exert their independence at every turn, try not to make brushing teeth a battle at this age. It’s definitely a good idea to bring your child to see our Dental Therapist who is experienced in the care of children’s teeth. 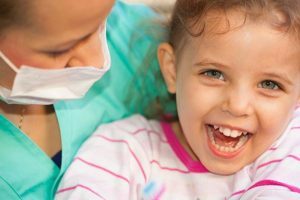 2 years – If they haven’t already been, now is definitely time to schedule a visit with our Dental Therapist who is experienced in seeing children. Between 2 and 3, your child’s primary teeth will most likely finish coming in, and home dental care becomes even more important as you help your child establish good lifelong habits. Remember that this is the age of independence and let your child brush their own teeth before going over them yourself. A small pea-sized amount of a low flouride toothpaste, such as Colgate’s “My First Toothpaste”, is recommended. Your child should thoroughly spit out any excess toothpaste once they have finished brushing, but do not rinse. 3 years – Make sure that you remember to schedule your child for regular dental check-ups, we recommend every six months at this age. Between visits, make sure to teach your child to brush after meals and avoid excessive amounts of sugary or acidic foods and drinks. 4 years – Remember to schedule your child for regular dental check-ups, recommended every six months at this age. Between visits, continue to encourage your child to brush after meals and avoid excessive amounts of sugary or acidic foods and drinks. While it is likely to be another year or two before the baby teeth fall out and the permanent ones come in, it is just as important to learn to take care of this set as it will be to take care of the adult ones as they come through. 5 to 6 years – Regular dental check-ups are in order, both to teach good home care and to detect early dental problems. Again, we recommend visits every six months at this age.